The upside down echeveria. 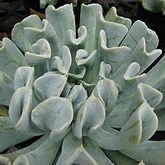 Powdery-blue leaves upwardly curving in a rosette 6ins, high with offsetting rosettes. Flowering late-summer orange-yellow flowers if a good summer. Dry soil with good drainage in winter.